There has been speculation over the years about whether or not affiliate links on a website can hurt a site or not when it comes to SEO and Google rankings. The question came up today in the Google Webmaster Hangout, and John Mueller addressed how Google views affiliate sites. First he said Google doesn’t have anything against affiliate sites and they can rank well. He said the issue is affiliates who simply throw up an affiliate feed and call it a day without doing anything to change the feed or creating unique and useful content for visitors. Of course affiliate sites can be really useful, they can have a lot of great information on them and we like showing them in search. He then continues to say the issue isn’t that affiliate websites don’t rank well, but it is really a case where there are a lot of really bad affiliate sites that are nothing more than a republished affiliate feed, and those won’t rank well since they don’t really have value to the user. But at the same time we see a lot of affiliates who are basically just lazy people who copy and paste the feeds that they get and publish them on their websites. And this kind of lower quality content, thin content, is something that’s really hard for us to show in search. Because we see people, sometimes like hundreds of people taking the same affiliate feed, republish it on their websites and of course, they are not all going to all rank number one for those terms. The importance of ensuring an affiliate site ranks is making sure they have – wait for it – unique, high quality content. Without it, an affiliate site just won’t rank well when there are plenty of other high quality alternatives to show. We really want to see unique, high quality content and that is something that we do like to rank. So it’s not something where we per se say that an affiliate sites are bad, we just see a lot of bad affiliate sites because they are people who try to find the fast way to publish content on their web, which sometimes being fast is good is also good, but you really also need to make sure you have a really great website where people want to go to your website to get the information that they can’t find anything else. 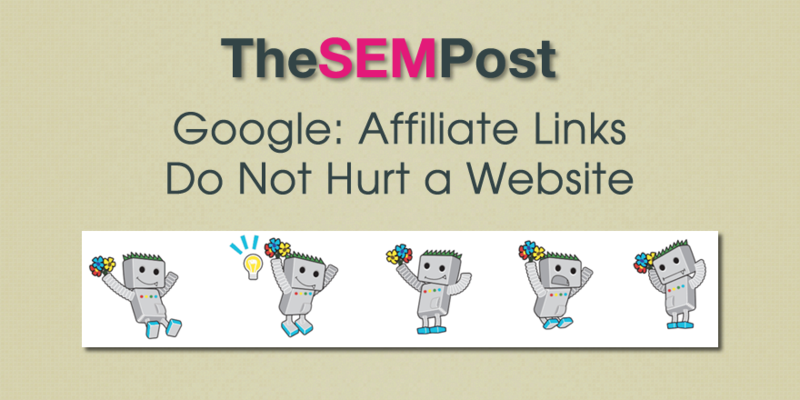 Lastly, he dispels the myth that affiliate links can somehow hurt a website. We have seen some some SEOs go to great lengths to obfuscate or otherwise disguise an affiliate link from Googlebot. And if you have affiliate links on a website, that is great, that is not going to be something we would count against a website. But definitely an interesting perspective by Google on how affiliate sites fit into the world of the Google search index.